We are creating import files in two formats CSV (.csv) и Excel XML (.xml). For editing you can use any spreadsheets editors like: Microsoft Excel, OpenOffice and LibreOffice. I am using LibreOffice on my Mac, it’s free and fast enough unlike OpenOffice. Below you can see a list with required product attributes that should be filled for each product in import file. type simple, configurable, bundle, downloadable, virtual Type of importing product, usually it “simple” product. You can import in Magento all listed types, but import wouldn’t be full for bundle and configurable products. The main reason is that we can’t link simple products with bundles or configurable due Magento limitations. Here we can list with non required product attributes, but I think we should fill it while first product import in Magento. Note! If you set the same value for base, small and thumbnail then only singe image would be uploaded. Besides, it’s not good to add system attributes which values you don’t understand. For example, when export of products with different attribute has been executed, import of certain system attributes can cause problems during importing, but you can easily add your own custom attributes. For importing we need to login in Magento admin panel and move to System -> Import/Export -> Dataflow – Profiles. Next let’s add import profile and press button “Add New Profile”. Change profile setting as described in table. Change profile settings as described in table. File Information Interactive Loading file in admin panel. Local or Remote server File could be uploaded from local or remove server by FTP. Need to provide required data like: filename, path, host, username, password e.t.c. Spreadsheet Name Name for sheet in XLS file. Leave blank to use first spreadsheet. Value Delimiter Value line separator, leave by-default. Enclose Values In Values will be wrapped with quote by-default, leave it as is. Move to System -> Import/Export -> Dataflow – Profiles. If you choose interactive way of uploading, then move to the tab “Upload file” and upload it. Move to the tab “Run profile” and press the button “Run profile in popup”. Wait for the end of loading and indexing. That’s all I hope it’s everything worked out. You can check catalog in admin. Below there is a short video with the repetition of the setting up profile and importing products. 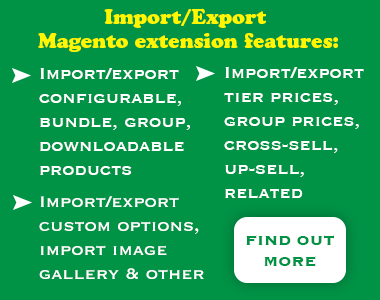 Magento does let you import configurable, bundle, group, downloadable products, you can check our paid extension for that purpose. Please click here to open the product page.